The Ministry of Education of the Basque Government and the BERC (Basque Excellence Research Centre) Basque Centre for Climate Change, BC3, jointly organize the Training Caravan (Researchers at classroom) initiative that has been active since 2010. This initiative (10th edition this year) is organized under the BC3 Responsible Research and Innovation (RRI) Programme Framework. Responsible research and innovation is an approach that anticipates and assesses potential implications and societal expectations with regard to research and innovation, with the aim to foster the design of inclusive and sustainable research and innovation. Responsible research and innovation is key action of the ‘Science with and for Society’ objective. 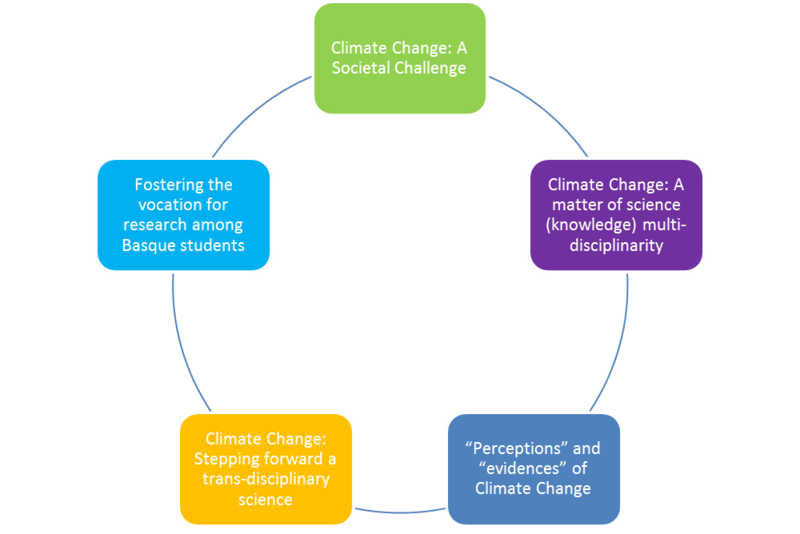 BC3 is firmly committed with this objective on its transition towards a Trans-disciplinary Science , that will be one of the key axes of BC3 future strategy to best address the complex challenge of Climate Change. As fact, Training Caravan (Researchers at classroom) initiative was promoted via ‘Science with and for Society’ objective as one of the actions on the thematic elements of its RRI programme Science Education. With the objective to better align both the BC3 research process and its outcomes with the values, needs and expectations of society, BC3 launched the Training Caravan (Researchers at classroom) initiative in 2010, targeted at Basque Country´s students aged (17-18). The aim the Training Caravan initiative, underpinned by the Science Education thematic area of BC3´s RRI Science Education, is to provide evidence(science)-based answers to some central questions about climate change, drawing on the best current scientific understanding and at the same time, making science education and careers attractive for young people.